Moldova is a country full of internal contradictions, be it the ongoing dispute about its identity or the political divisions within it, and these divisive forces look like they’re finally about to spill over into a large-scale destabilization. The purpose of the present work isn’t to take sides in these various issues, or to offer much commentary on the Transnistria issue that’s frequently glossed over by mainstream analysts. Rather, the article endeavors to explain the intricacies of the Moldovan state structure and provide an objective assessment about the viability of the latest regime change efforts against it and the efforts of the state security services to thwart this scenario. Additionally, it answers the popular question over whether or not the unfolding events are another Color Revolution, before concluding on a forecast for what can be expected in the coming weeks. The most important thing that all observers need to recognize when discussing political pandemonium in Moldova is that it’s all traceable in one way or another to the elected legislators in parliament. These individuals elect the President, who in turn approves the Prime Minister. The composition of the present Moldovan parliament is quite unnatural, and it’s for this reason that the country is politically incapacitated at the moment. The elections on 30 November, 2014, saw the “pro-Russian” Party of Socialists gain the greatest electoral and parliamentary plurality, achieving 20.51% of the vote and being handed 25 seats. Right behind them was the pro-EU Liberal Democratic Party that brought in 20.16% of the vote and received 23 seats. This group allied with the Democratic Party of Moldova (15.80% of the ballot with 19 seats) and the Liberal Party (9.67% of the total and 13 seats) in order to form a broad pro-Western governing coalition. Still, despite handing them 55 seats out of the 101-seat assembly, they still have less than a majority of the total vote, garnering only 45.63% of the popular will. Similarly, the opposition Party of Socialists, the single-largest holder of electoral plurality, is also in less than a majority in their opposition coalition with the Communist Party (17.48% of the vote with 21 seats). This points to an array of independent candidates constituting the 16.38% popular difference, despite none of them being large enough on their own to actually enter the government. The particularity of two of the three largest parties (including the largest plurality victor) being in the opposition while the second-largest party managed to form a governing coalition with the rest of the political ‘scraps’ explains why Moldova is so polarized at the moment. The unnatural nature of the ruling coalition is precisely a result of the West’s political pressure in trying to promote their New Cold War agenda against Russia. Not accounting for the 16.38% of votes given to non-institutionalized political candidates and parties, then the Socialists and Communists together nearly acquired a majority of the popular votes that landed representatives in parliament (37.99% out of 83.62% for all five major parties). A little less than a 4% electoral difference separated them from receiving most of the vote for the sitting parliamentarians, meaning that a coalition with the Liberal Party would have been all it would have taken to clinch an electoral majority and a slightly higher combined popular plurality than the current coalition. Alas, it wasn’t to be, and the present parliamentary setup is the reason why Moldova has so many problems right now. The immediate trigger for the latest unrest was the nomination of a new Prime Minister, and although the media tried to draw attention to the protesters’ opposition to this individual, the root of the problem and the core of the protesters’ demands are that the present parliament must resign and early elections be held as soon as possible. To recall what was mentioned above, the parliament is the ultimate political agent in Moldova, having the power to elect the President every four years (with the next cycle slated for some time this year), who in turn appoints the Prime Minister. The only way to rectify the unnatural irregularities in parliament is to hold early elections (which the “pro-Russian” parties would be slated to win if they were held right now), since the governing coalition will unabatedly continue to push their radical pro-Western political agenda if they aren’t stopped. It must also be said that the President and Prime Minister are largely figureheads when it comes to domestic affairs in Moldova. The country’s oligarchy, ‘legally’ represented by various parliamentarians, is the force that’s really in charge of the country, with the upper echelon of the nation’s leadership being useful only in providing internationally recognized signatures for various geopolitical and geo-economic projects (soft NATO expansionism and the EU Association Agreement, respectively). These are also very important and directly impact on the wellbeing of the common people, but in terms of most immediate responsibility, the protesters’ ire is concentrated on parliament, the forces most directly accountable for the country’s predicament and anything that the President and Prime Minister subsequently support. Therefore, although the protesters stormed parliament in reaction to the nomination of a controversial Prime Minister, it can be surmised that the action was just as much directed against the ruling parliamentarians as well, since these are the only political agents capable of effecting the change that the protesters are seeking. The electoral cycle has already been exhausted and won’t officially recommence until 2018, meaning that if the protesters want to enact any tangible impact on their country’s trajectory, they must pressure the state enough to the point that early elections are called. As expected, this means that their demonstrations will predictably intensify, with the resultant effect being that they’ll come into tense contact with the state’s security services. Herein lays a paradox for the authorities. The security services are the vanguard of state influence and the vehicle through which the authorities retain their position. Sooner or later, while police and other security units are resisting the protesters, they’ll either independently and reactively resort to violence or be explicitly ordered to do so, thus creating a major complication for the governing coalition’s legitimacy. Former Ukrainian President Yanukovich was denigrated by the West for using even the bare minimum of force in feebly trying to fight back against EuroMaidan in 2013-2014, yet surprisingly enough for some, it’s not likely that the same standard will be applied against the pro-Western coalition in Moldova in 2016. All media polemics aside, however, the use of state force to quell an anti-government movement carries with it inherent risks for the state. If the ‘gatekeepers’ increase their use and frequency of force against determined enough demonstrators, they inevitably invite those individuals to adapt Unconventional Warfare tactics and move away from their reliance on Color Revolution means. In other words, undisciplined and/or disproportionate state violence can provoke, rather than soothe, Hybrid War fears. On the flip side, refusing to use selective force in the face of a strong anti-government movement increases the likelihood that their regime change goals will ultimately succeed. Ideally, the state would prefer never to be placed before this dilemma, but if civil society pressure is too much, then they’ll be prompted to act one way or another – either conscientiously choosing to use force like how Erdogan smashed the Gezi Park protests, or refusing to do so like Shevardnadze and reaping the resultant regime change consequences. At this point of the study, it’s appropriate to address whether or not the recent events in Moldova constitute a Color Revolution. Unquestionably, Color Revolution technology such as rowdy protests and the storming of parliament are visibly being applied, and there’s an explicit regime change goal being vocally expressed. However, the key difference between what’s happening in Moldova and what occurred elsewhere is that there is no discernable foreign component guiding the protesters’ actions, which is an inarguable prerequisite for a mass movement to conventionally be called a Color Revolution. Although it may superficially appear as though Russia has something to beneficially gain from reversing Moldova’s pro-Western course, there’s no proof whatsoever that links the Kremlin to Chisinau, and Moscow has voiced its concern over the increasingly violent turn of events there. Apparently, some sort of political process is occurring in Moldova which analysts have yet to identify, but which clearly doesn’t fit into any of the existing models. Instead, what’s being witnessed is the inevitable proliferation of Color Revolution technologies to independent actors that operate outside of any state influence. These individuals are quite literally non-state actors in every sense of the word, and the ones that are currently protesting are not under the influence of either the US or Russia, although it’s conceivable that Washington might infiltrate some provocative elements into this movement in order to discredit its cause and prompt a state crackdown. By and large, however, the Moldovan protesters are totally independent of any external patron, having acquired their Color Revolution knowledge through the widely disseminated open source materials available on Gene Sharp’s website. It may have taken decades for non-state actors (whether genuinely so or behaving as front organizations for state sponsors) to develop Weapons of Mass Destruction, but Weapons of Socio-Political Mass Destruction, as in Color Revolution technologies and their eventual Unconventional Warfare evolution, only took about a decade and a half to enter into the hands of genuinely non-state-affiliated movements. There are no indications that the protests will let up any time soon, thus accelerating the chances that the protesters and security services will come to blows in the coming future. The ruling coalition’s viability is directly dependent on whether or not they order the police and related forces to crack down on the demonstrators, and the loyalty of these units is also a factor that shouldn’t be fully assumed. Depending on the chain of violence that breaks out after the first significant clashes, the police, many of whom are just regular Moldovans like the protesters themselves, might not agree with carrying out the further heavy-handed or lethal orders that they may be given, raising the chances for an outright mutiny, or at the very least, passively allowing the protesters to access parliament and other state institutions that they’re supposed to defend. If the escalation of violence reaches an unprecedented level, then the protesters might likely begin engaging in selective Unconventional Warfare tactics, be it Molotov-bombing certain governmental structures or shooting at police. If this happens, then daytime curfews and even martial law might be implemented in Chisinau until the authorities can return the situation to order, but by that time, the critical mass of anti-government demonstrators might be too much to handle without further escalating the violence threshold. Remembering the “gatekeepers’ paradox” that was described earlier in the work, the state might unintentionally aggravate the situation beyond its control, thus contributing to a large-scale breakdown in security and the further deterioration of the situation in the capital. As a flailing last resort, it may request some form of overt or covert foreign intervention to prop up its authority, perhaps manifested by some nature of Romanian assistance. 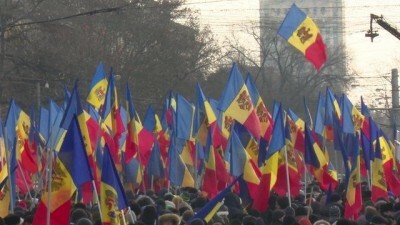 In the absence of a committed foreign patron, the weak Moldovan government will almost certainly fall to the protesters with time, barring of course an indiscriminate rampage of state-directed terror that scares the more moderate protesters (assumed to be the overwhelming majority of them) into submission. In parallel to the abovementioned scenario or in place of it, the Moldovan authorities might try to desperately divert attention from the intensified flare-up of anti-government activity by engaging in a provocation against Transnistria. Relations between Chisinau and Tiraspol are already quite frosty, made even worse by Moldova and Ukraine’s coordinated efforts at attempting a blockade of the region. From an American strategic standpoint, Russia may not be able to sustain a concentrated military-strategic focus on Eastern Ukraine, Syria, and Transnistria simultaneously, especially since Moscow does not have direct access to the latter nor does it have any neighboring allied states that it can use to access the potential battlefield (as it does with Iran and Iraq vis-à-vis the Caspian Corridor to Syria). Although a risky gambit by any forecast, Moldova’s pro-Western ruling coalition might attempt this scenario as a last-ditch effort to stave off their overthrow, hoping that a continuation war in Transnistria would lead to NATO military support in some capacity that could then be diverted towards squashing the protesters. It may appear like a short-sighted plan to most readers, but they’d do well to consider that a government which is truly on the rocks can only resort to short-sighted policies for its immediate survival.